John DeVore, ‘Top Banana’ at DeVore Fidelity, known for their outstanding speakers that have names of Monkeys (such as Gibbon, Orangutan) occasionally holds ‘Monkeyhaus’ events at the DeVore Fidelity factory located in the Brooklyn Navy Yard in New York City, right across from Manhattan on the East River. Monkeyhaus is DeVore’s pet name for the factory. A large and sprawling area going back to 1801 and very active during WWII, it is now a commercial space with 200+ businesses; from audio to film and even distilleries. Somewhere in the middle of this enormous space (225 acres) on the 5th floor of Bldg 280 is DeVore Fidelity. A large modified warehouse space with very high ceilings, DeVore has converted it into his factory, including a beautiful and fine-sounding listening room—with, of course, DeVore Fidelity speakers. This particular Monkeyhaus event (March 16, 2018) focused on Newvelle Records, founded by Elan Mehler a pianist/composer, who was playing LPs from his two already released seasons (1,2) and upcoming new seasons of releases (3 and 4), many of which were test pressings. The sound quality was incredible. They specialize in jazz. A genial and knowledgable guy, Elan Mehler, you can’t miss him: he is about 6’ 7” tall [see photo below of Elan, yours truly and John DeVore]. The tall and the short of it. The ‘Gibbon Super Nine’ speakers were in play at this event, and the lights were dimmed with an orange glow giving a warm and cozy feeling throughout. Beer, wine and liquor flowed and locally made pizza galore was served later on. A variety of musicians who play on the Newvelle label were there too including bassists Rufus Reid (and Ben Allison) guitarist Steve Cardenas, and together with their recording engineer Marc Urselli, mastering engineer Alex Deturk, and even studio photographer Anna Yatskevich. This offered a rare and casual experience of listening to their recordings on vinyl extraordinaire and asking questions. 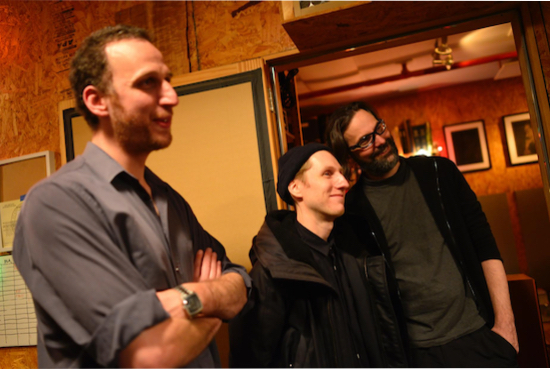 Elan Mehler (L) with mastering engineer Alex Deturk (M) and recording engineer Marc Urselli (R) looking on proudly while the musicians they represent listen on vinyl to their work. On the couch: (left) Steve Cardenas (guitarist), Ben Allison (Bassist), Rufus Reid (bassist). Woman on the right with camera: Newvelle studio photographer Anna Yatskevich. When I first arrived I heard music that reminded me a dash of guitarist Bill Frisell. It turned out that it was a Newvelle release of Steve Cardenas with Thomas Morgan on bass. Beautiful. I then realized that I was standing right next to Cardenas. Weeks earlier I had heard a live performance by Frisell and Morgan (as a duo). More of a treat was to come: Mehler played a test pressing of upcoming (August 2018). Yes, it had uncommon depth and beauty. Both Cardenas and bassist Ben Allison mentioned how different it is as a musician, to hear your playing on a high-end system with loudspeakers and a large and deep soundstage versus on headphones—let alone while playing live. You could see them intensely listening to their LPs playing. Allison spoke of his fascination of hearing himself separated into two channels in stereo and discussed it at depth with his recording engineer Marc Urselli. 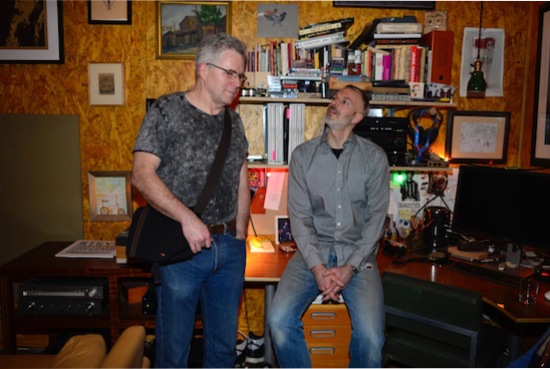 I traveled to the Monkeyhaus from Manhattan with my friend and neighbor Jim Austin, and just as happened last time I visited DeVore Fidelity—we got a bit lost once we reached the Navy Yard. The weather was freezing cold, but we survived: we found a very friendly local pub and had a drink; then we found Bldg 280 soon after. Jim Austin of Stereophile and John DeVore. 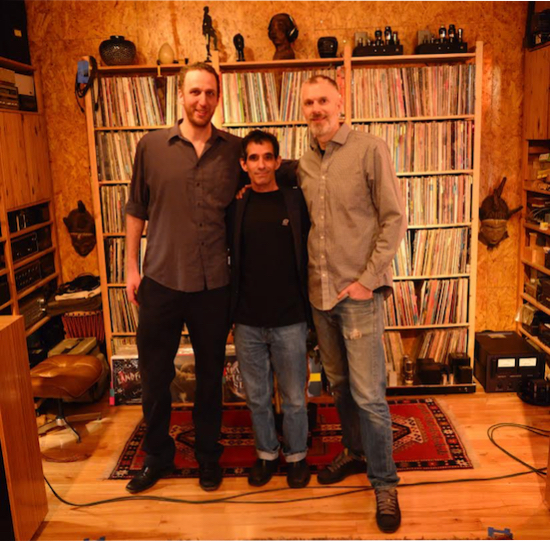 This Monkeyhaus event hosted by DeVore and Mehler was a treat; very friendly and open with a great mix of musicians, recording professionals, jazz aficionados, and of course stunning sounding jazz LPs. Newvelle Records' business model, with nearly all proceeds and ownership going directly to the artists, is yielding some fine results. I hope they keep it up.